Comet is a three year old male Greyhound cross Saluki. A very striking dog to look at, Comet is a big, bouncy boy who has been living in a foster home for a few weeks to prepare him for a forever home. He has settled in very well and gets on well with the other dogs living in the home, both male and female. Comet adores people and enjoys being made a fuss of. He also loves to be outside and walks well on the lead, although he can get excited when he sees wildlife. Comet knows some basic commands and is quick to learn. In fact he has learnt how to open doors, which has become a bit of a party trick and so, to start with at least, it would be best to make sure any doors are locked to prevent him inadvertently letting himself out. 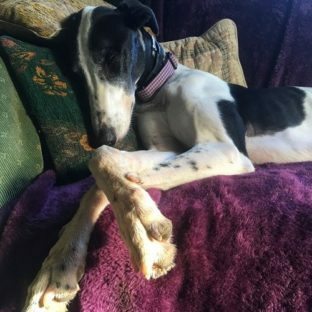 While Comet is generally very happy, he can also be a little sensitive and anxious, so he would be better suited to a home without children, and he can’t live with cats. He will need a calm home environment, and owners who will be kind and consistent with him, so he knows what is expected of him.